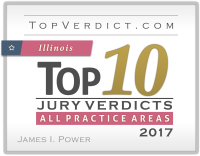 In addition, Mr. Power assists Mr. Devon Bruce in pursuing environmental claims on behalf of home-rule cities and small towns across the State of Illinois. A motion to dismiss based on the Contact Sports Exception in a case involving a high school cheerleader who suffered a concussion during her team’s competition, which was denied in February of 2017. Mr. Power has extensive experience in the areas of pre-trial motion practice and pre-trial litigation, including the taking and defending of expert and fact witness depositions. The Plaintiffs worked for a law firm in the large office building located at 500 West Madison Street. Allied Barton provided Security Services to the building. On December 8, 2006, a former client of the firm’s entered the 500 West Madison office building armed with a revolver, chain, padlock, hunting knife, and hammer in order to seek out and kill one of the attorneys who he mistakenly believed had wronged him. After loitering in the building’s lobby and being turned away by the security desk, the former client was permitted access to the law firm, located on an upper-level floor, by Allied Barton security. Once he had gained access to the law firm, he shot and killed three individuals and injured the fourth. Joseph A. Power, Jr. represented the Estate of M.M. and recovered $14.6 million for his client. Larry R. Rogers, Jr. represented the Estate of A.H. and secured an $11 million verdict for his client. James Power represented R.L. and secured a $5 million verdict. Breach of contract: After a complex trial, a Cook County Judge ordered Ron Gidwitz, Donald Trump’s Illinois finance committee Chairman, to pay his former attorneys $5.7 million in unpaid legal fees. Judge Patrick Foran Lustig ruled that Gidwitz breached his contract with Ungaretti & Harris by refusing to pay fair and reasonable legal fees incurred on his behalf. Co-counsel Joseph A. Power, Jr.
Mr. Power grew up in the City of Chicago, on the City’s Northside, prior to attending the University of Arizona where he studied history and political science. After obtaining his undergraduate degree in 2012, Mr. Power attended Loyola University Chicago School of Law. During his time at Loyola, Mr. Power focused his studies in the areas of civil litigation and trial advocacy, while working full time as a law clerk for Power Rogers & Smith. In 2016, Mr. Power received his JD from Loyola as well as a certificate of merit from the school’s trial advocacy program.